Negative Energy – Toxic People – You Know the Type. Let’s make one joint resolution for 2012. We won’t let toxic people – persistently negative personalities – dictate our lives. I chanced on a book that can’t be judged by the black border that swallowed the original cover…or the year it was first published (1999) and thankfully, since updated. The content is more current than the evening news. Stop suffering! Dr. Lund’s book is one of the most influential books I have read. 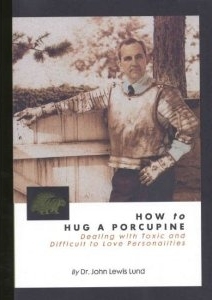 The subtitle to the book is “Dealing with Toxic and Difficult to Love Personalities.” His prior book “The Art of Giving and Receiving Criticism,” contained some of the information in this current book, but “How to Hug a Porcupine” is better organized and more concise. The book spends a large amount of time in identifying the characteristics of “emotional porcupines.” These emotional porcupines are usually people that seek to control their lives and the lives of others. They constantly throw emotional quills and consequently are difficult to hug without impaling one’s self. The most interesting part of the book is on how to live with a “porcupine.” The strength of this self-help book is that it gives you concrete ways to protect and arm yourself from the damaging quills of emotional porcupines. Soon after reading this book, I changed my cell phone to read “No Critics”, to remind me of the damage that any criticism (there is no such thing as constructive criticism according to Lund) can do to others and to remind me to not criticize. Dr. Lund’s book is full of insight and, most importantly, methods on how to improve yourself if you are a porcupine and also on how to deal with porcupines without damaging your own ego. Dr. Lund also has a tape out that covers similar material, but I believe was recorded well before he wrote this book. This is a book that can help anyone in their relationships with children, siblings, parents or spouses.